The little reading that I’ve done about you clearly suggests that you quit advertising to pursue a career in comedy. Why such a drastic change? I had reached a point in my life where I wasn’t happy with where my career was heading. Basically I wanted a job that didn’t start before lunch, something that was creatively stimulating, with a lot of travel and one that had a flexible leave policy (read “take leave whenever I want”). More so the idea of working for someone else was just not rewarding enough. I always knew I would eventually end up doing something of my own. The fact that it turned out to be comedy was a pleasant surprise. I have to love what I’m doing otherwise I just can’t do it. Money is not motivation enough. What do you love most about being a comedian? I love everything from the travel, meeting so many people to the sheer fun that I have every time I’m on stage. It’s great to be a part of the English comedy revolution in India because we’re right at the forefront of it all. Everything we do today sets the tone for and builds the industry tomorrow. Where else would you get a chance to build an industry as opposed to trying to fit in to an existing one? It’s quite an enviable position, one that I’m grateful to be in. How did you get yourself to quit a fulltime job? I was working for an ad film production house called Ravi Deshpande Pictures. The decision to quit the fulltime was more organic than anything else. I knew I wanted to do something of my own. The timing of the comedy scene and a couple of other personal situations gave me that push I needed to make that leap. There has been no looking back since. How challenging was the transition from advertising to comedy? The transition was more lifestyle in nature than professional. It took some time to get used to not having a pay check at the end of the month. The initial 8 months or so in terms of financial security were quite rough. I took up odd writing jobs to pay the bills while I did open mics on the side to get better as a comic. August 2012 was when things turned around for me and I was then able to focus entirely on comedy. I still feel I have only just started and there is still so much to do. You’ve studied computer science. Then an MBA in advertising. What did you actually want to pursue? I had absolutely no idea to be honest. And I’m thankful for that, otherwise I wouldn’t be here. As a society we are conditioned to stick to the mould, play it safe and live a tried and tested life. I just reached a point where I was plateaued with my first job, which led me to do my MBA, where other areas of marketing initially caught my fancy. During these two years of college I tried stuff I never thought I would. I got involved in wildlife conservation (specifically snakes), began to host a lot of events, did a short stint in radio all of which led me to find out more about what I really saw myself doing. Stand-Up happened purely by accident, something I did for the fun of it and now I cannot imagine doing anything else. Not knowing what I wanted was perhaps the best thing for me. You were apparently a snake-catcher in college. Tell us more about this. Part of my curriculum during my MBA required me to do a social internship. I opted to work for a wildlife NGO based in Goa where I worked closely with snakes. The understanding of these marvelous animals got me obsessed with them. Later when I returned to college in Pune, which is located on the outskirts of the city in the hills I was pleased to find that we had a lot of snakes around us. I was in charge of rescuing and relocating any snakes that strayed into campus. It just stuck from then on. So I get involved in rescues and spread awareness about snakes as and when I can. Where did you complete your schooling and college? I studied at Holy Family High School in Porvorim and then St. Xaviers, Mapusa. Now since you’ve established yourself as a comedian, how are you executing this skill? I just perform as often as I can, all over the country. Besides Stand-Up, I also write for a comedy show called ‘Son Of Abish’, co-founded a musical comedy collective called ‘The Yellow Experiment’ and work as a producer with Vir Das’ Weirdass Comedy. What is the skill-set one should possess to become a stand-up comedian? You need to have a lot of guts to begin with. It’s not easy to get up on stage all by yourself, speak to a large crowd and make them laugh consistently every 20 to 30 seconds. In terms of a skill set I’d say good writing and public speaking ability form the core, surrounded by a sharp sense of observation and understanding of the world, people and emotions. Additional qualities like having a strong mindset that can deal with rejection and failure and a lot of discipline will take you a long way. Stand-Up is a very scientific process. Every word, pause and its delivery is crucial in getting it right, which is why it takes years to get anywhere close to good. There is no room to get complacent. This is what makes it a lot of fun. When did you launch your own comedy production company and why? I launched Microphone Entertainment in mid 2012 with the aim of curating comedy shows and getting exposure beyond the only comedy club around at the time; The Comedy Store. There were a lot of us only just starting out at that time but there were no stages to perform which was slowing down growth. Microphone Entertainment was able to set up comedy properties across Mumbai and Pune which played a small role in building up the scene. Presently, we continue to curate our most successful comedy property, ‘Freakin Highlarious’ at High Spirits Pune. What is the purpose/ mission of your company? We started with the vision of taking Stand-Up to places that have seen little or none of this great art form. This was made possible by setting up comedy properties across Mumbai and Pune. We also worked with brands who wanted to leverage comedy and set up tours in cities like Delhi, Bangalore and Kolkata. We’re a one stop shop for anybody looking to have a comedy event programmed and executed at their own venue or company premises. The long term plan is to be a comedy powerhouse centered around live shows and hopefully someday even produce online content and films. What is the process you follow to put together an act? It all starts from ideas or observations that I think might be funny. I write them down and develop jokes or bits around them. The bit is then tested at an open mic to see how it works with audiences. It then goes back to a rewrite until all unnecessary words are dropped and the ones that remain are arranged and delivered in such a way that you get a laugh. This is an ongoing process that is followed and then you eventually end up having a good 30 minutes of material which is when you become a commercially viable comic. Stand-Up is a lot like music. Just like a band that has a setlist of songs they take on stage, comics have a setlist of jokes that they choose from. Over time, new jokes will be added and existing ones will evolve. The material also changes as the comic himself evolves in life and is a reflection of his own reality. Since you’re jump to the comedy world, what have you done to promote yourself? To begin with, as you get booked for shows the promoters themselves market you which starts the initial awareness. With social media like Twitter and Facebook, self-promotion becomes easier and costs nothing. I’ve recently been signed on by The Canvas Laugh Factory who now manage me, so building me as a brand is now a collaborative effort between them and me. Tell us about your first gig. Were you nervous? How did the audience welcome your work? My first gig was during my MBA at SIMC Pune. I’ve been on stage pretty much all my life but this was the most nervous I have ever been. It was just me on stage, no back up, mic in hand, trying to make over 200 people laugh. It was quite a sinking feeling but I told myself that if I could get through this, I could get through anything. Thankfully it went well. I still get a wee bit nervous seconds before I go on stage, which is a good thing, because it keeps you grounded teaches you not to take things for granted. Now tell us about how you grew over the last two years. After I quit my job I performed at open mics and showcase gigs that featured upcoming comics. Starting my own comedy properties was a big help. I got on stage more often, got more confident and then built my solo career from there. Once I got to 30 minutes, I became a regular feature act at The Comedy Store, Canvas Laugh Factory and other venues across the country. Corporate shows also started pouring in. I’m currently juggling various roles (solo artist, writer, producer and musician) so that I believe will be the next step of my growth. It’ll be interesting to see what I can do with it. You said you were born in Bombay, but spend a good amount of time in Goa. Does this stay in Goa contribute to your scripts in any way? To some extent. I do talk about my life in Goa in my set. Having lived there for so long it gives me a unique perspective that differs from the regular tourist one. It’s all subjective and depends on where I want to take my comedy. But on a personal level, yes my time in Goa has made a huge impact on who I am today, including that guy you see on stage. How does it feel to face an audience that’s expecting a good amount of humour to spread through the room? Comedy is my career now. I have made my peace with audience expectations. My job is to entertain, so every time I get on stage I make sure I do what needs to be done. Eventually, it’s just like any other job, except that it is way more fun. Do I think I’m meeting all expectations? The fact that I have a busy calendar possibly suggests that I’m getting a few things right. But I never get complacent. I will always be work in progress. There is no time to sit down and bask in adulation. It’s about getting better and better. It never ends. What’s your take on stand-up comedy in India? The growth of Stand-Up is good news for everyone. It’s been long overdue. We’re a country filled with so much of fodder for every emotion conceivable, why must laughter be left far behind? Comedy is a great stress buster which can be used both for entertainment as well as social commentary. There are many reasons for this growth. Comedy sells itself. If packaged and delivered correctly (which is happening) it is a brilliant value proposition. Do you know anyone who does not like a good laugh? Neither do I.
I believe the next decade is going to be about alternative careers. For the first time in this country we are witnessing so many young people taking up their passions and turning them into successful businesses. Comedy is at the helm of this trend. Where all have you travelled spreading laughs and giggles? I’ve performed in every major city in India including Mumbai, Delhi, Bangalore, Hyderabad, Kolkata, Pune, Coimbatore, Kochi and Goa. This Easter, I will be performing at the Utrecht International Comedy Festival in the Netherlands followed by shows in Amsterdam. There are a few other international tours in the pipeline as well. Ultimately the plan is to do this as far and wide as possible. Any plans of taking this to Goa? I have a done a couple of shows in Goa. There are plans to bring Stand-Up to Goa in a big way but it may still be a while before that happens. This is a very different market so when we get here we want to make sure we do it right. I have a vague idea. It has something to do with a mic, a stage, airports, 5 star hotels and hopefully a fancy sports car or two. Whatever it is I’m doing five years from now, I want to have fun doing it, I want to give my family a good life and if I’ve entertained a few people along the way I’ll be a happy comedian, always hungry for more. During the last week, I came across a number of quotes on happiness. Coincidentally, I also signed up to #100HappyDays, a campaign being run on social media platforms that’s encouraging people to share one thing that bred happiness for 100 days in a row. One evening, a hostelite was sharing with me how happy she’s been after moving to Bombay. I couldn’t agree more! This city has not lost its charm. But there was one feature in particular that she focused on — being independent. Undoubtedly, live a year in Bombay and you will develop this skill which is only refined every time you stand up for yourself. Being independent gives us the freedom to do whatever we want without worrying about what my neighbour has to say about it. To cite an example, one of my friends Rachana from Mangalore relocated to Bombay to craft a career for herself. When she took a break to see her family back home, one afternoon, she walked to the nearest KFC and enjoyed a meal by herself. When she told this to her parents, they were stunned. This is what Bombay does to the many of us. You feel like gobbling down some ‘paani puri’, you don’t need company for that. Scout around for a street stall, and enjoy the snack! Another advantage of being independent is that you are not accountable to anyone. Your plans don’t depend on anyone else’s plan. You can pack you bag and take off whenever you think you need a break. Again, an independent person doesn’t normally need to wait for someone to come up to him/ her and suggest that s/he needs to take a break. Come to think of it, the pros of being independent will run into pages. What I love most about being independent is that it relieves us from feelings of guilt because all decisions are taken by us and if we go wrong; we have no one to blame but us. Invariably, we the people of Bombay are assumed to be emotionless. It’s actually not what everyone thinks it is. After a point, the city teaches you how to seal your emotions and carry on like the suburban trains do. These gigantic worms don’t wait for anyone; if you’re late by a second, you will miss the train. Then wait for another one to grace the platform. But being independent isn’t all hunky-dory. If you fall into an open drainage, you will have to struggle your way back out of it. At times, discipline goes off track. But as long as you can peep into optimism, and treat these situations as a learning experience, we’re good to continue our ride. Self-reliance is what many Goans in Bombay have learnt after they were thrown into the sea of chaos. Bombay gives you two options — you can either learn to swim your way out or let it overwhelm you and drown. Most of us choose the former because it teaches us how to take control of our destiny and be ourselves. Replug of the feature from The Goan on Saturday. Two and a half decades ago, a Goan lad fell in love with a girl named June, but never gathered the courage to confess his love. Years went by, and there was no progress. In 1998, this pretty young lady married another man and the overwhelming distress led Walter Noronha to bury himself under work. However, he wasn’t sure about what he should pursue after completing a degree in Commerce. Rewinding to his days post junior college, Walter did dabble a bit in the hotel industry, but didn’t like it there. After graduation, he took up a job as a Counter Salesman at India Photographic Company Limited, but as this work was monotonous, he quit and decided to study further. He enrolled himself to a Marketing and Advertising course at Xavier’s Institute of Communication (XIC) in Bombay, but it was still difficult to get a job. So he decided to round it up and completed an MBA in Marketing from Mumbai University. Now, he was ready to venture into the advertising world. Through these years, only one element stayed constant — his love for June. After completing his studies, Walter got himself a job at advertising agency Saatchi & Saatchi where he worked as a management trainee for 11 months. He then moved to Triton Communications where he serviced clients and finally harboured at Ogilvy & Mather and grew to become one of the Vice Presidents of the company in 2010. All along, Walter stayed in touch with the widowed June. A few months into marriage, and June’s husband was diagnosed with cancer. Within two years, he succumbed to the bug leaving June with a son. A decade after June lost her husband, and when Walter knew he’d achieve the unexpected, he proposed to her. Today, Walter’s biggest achievements are his role at O&M and his wife. Walter has been loyal to his dream agency O&M since the last 14 years. According to him, if it wasn’t for the heartbreak, he wouldn’t have taken his career this seriously. He has been the recipient of several awards at national as well as international level for Cadbury and Dove, the clients he served for the longest time. Besides this, over the weekend, Loutolim-born Walter is a faculty at Don Bosco Centre for Learning in Kurla where he teaches Integrated Marketing Communication (IMC) to MBA students. For more than 15 years, Walter has been developing and managing brands across categories for global as well as local partners. At present, the brands in his basket are Cadbury and Star TV. He also leads the regional team with a remit extending to all of Asia-Pacific. Till date, Walter is extremely thankful to his parents for giving him the best education and filling in all his needs at the right time. According to him, Goa has its charm that is passed on to us because we belong to that state. Commenting on his long stay at O&M, he says, “The culture of Ogilvy is such that it feels like a second home. You can get a person out of Ogilvy, but it’s difficult to get Ogilvy out of a person, and with me, neither is possible,” he concludes. The Finest taste of Malaysia has been brought to Renaissance Mumbai Convention Centre Hotel. Currently, many of us are heading to the Renaissance to enjoy the Malaysian Food Festival in Powai. The hotel is temporarily housing Chefs Ridzuan and Rhap from Malaysia who hold a rich gourmet experience. Chef Ridzuan holds his expertise in Malay and western dishes, and Chef Rhap is a lady who is known for being a food adventurer is an expert of Asian (Halal) and Malay dishes. While Chef Ridzuan is skilled in handling buffet cold kitchen dishes, Chef Rhap is more skillful in handling buffet hot kitchen dishes. How would you describe authentic Malaysian food? People often ask me what Malaysian food is like, and I’ve found that it’s not as easy to describe as I would have thought. I usually have to explain that Malaysia largely consists of the Malays, Chinese and Indians – and we each have our own types of food. This is an overgeneralization, but I find that Malays are fond of using coconut milk in their food, the Chinese deep fry as many foods as possible, whilst the Indians love ghee. But as I said, this is me being generalised, and there is obviously more to each cuisine that what I have mentioned above. But of course, it’s not just these foods that make up the Malaysian food culture. There is a little (or big) something called hawker food. Hawker food is basically food you get from roadside stalls, and are usually fairly inexpensive. Have you altered any recipes to suit the India palate? Malaysian Indian cuisine of the ethnic Indians in Malaysia is similar to its roots in India, especially South India although there are many notable foods with influences from North India too.so the spices remains the same but some special ingredients like lemongrass, kaffir lime etc. makes the difference. How long is yours and Chef Ridzuan’s stay in India? And what do you plan to accomplish within this time? We are here till the dates of the promotion that is from November 14th – 24th, 2013. This is a great opportunity for us to showcase the Malay cuisines to the Indian guests and to learn a thing or two about Indian food culture and the people. This is also our first visit to the city of Mumbai, so we are excited to also see and explore in our free time and take back fond memories of its people and the place. Is there anything you specifically like about Indian cuisine? Chef Rhap: Indian food is very dynamic, robust, flavorsome. I especially like the vegetarian Indian food. There is a variety of fresh vegetables in India, and they all are prepared in unique and varying styles. It’s fascinating to see such variety within the Indian food from region to region. Chef Ridzuan: I really enjoy Indian food. I like the spice and tanginess used in most curries. I also enjoy the vast assortment of fresh bread (roti, naans etc) that compliment the curries. I have tried out the famous street food specialties such as bhel, paani puri and found it extremely fascinating and pleasantly unusual to our taste buds. I have a sweet tooth so really like the Indian sweet dishes as well. We tried the food at the Indian restaurant – Nawab Saheb and thoroughly enjoyed the kebabs and curries there. Why should anyone come to the Malaysian Food Festival at Renaissance? The festival has a very interactive Zing to it, chefs are always around to help you and customize food as per the guest desire. There are a lot of vegetarian options for the locals and eventually nothing but a genuinely authentic Malaysian food. What’s your favorite from the buffet you’ve spread for us all? Chef Rhap: My personal favorite would be the dessert (especially pandan crepes with coconut and jagerry) which brings a meal to a sweet ending with smile on a delighted guest. That’s what make me satisfy as a chef. Chef Ridzuan: My favourite dish is LAMB KERUTUP. I am very fond of lamb. The use of coconut milk with all the spices infused give it a distinctive taste and aroma. It’s full of flavor, heart and a complete dish by itself. What’s the one recipe we should taste and why? The vegetarian tom yum soup it is very home style recipe. It has its own unique and very Asian taste to it not very spicy or tangy but a subtle version. This is a replug of my column that appeared in The Goan on Saturday. Last Friday, one of my Goan hostel friends went over to her brother’s apartment in Dahisar for the weekend. That very evening, I pecked on some vegetarian food in the hostel foyer. On Saturday, I stepped out to meet some friends and treated myself to some delicious Goan style crab curry, bombil (Bombay Duck) fry and rice, of course! Where, you ask? It was at this petite Goan restaurant in Mahim. Sunday came along at its own lousy pace. Hostel served us biryani for lunch and I thought that was it for the week. Sunday evening, my friend returned with a bag full of food. And mind you, this was not any other food. I bet, only a Goan understands what it’s like to let a day pass without a piece of fish in our plates. This evening, we commenced dinner 15 minutes prior to our usual time. The aim was to relish every morsel, every bite. One by one, she opened the tiffin boxes that were resting in her bag. The aroma spread across the foyer which tickled other hostel girls’ senses too. Without wasting any time, I dug a table spoon into the crab curry, then into the yummy-looking bombil scramble she’d cooked and finally, I shamelessly took two pieces of fried fish. The last time I saw so much fish was when I was at home in Goa. For a good 45 minutes, all I did was buried myself under tales of fish and fisherwomen in Goa. Not forgetting, I was relishing every bite of what this dear friend had cooked and brought for me on her way back to the hostel. We shared stories of how fisherwomen arrived at our doorsteps every morning calling out names of fish that grew familiar to our ears. This happened a lot during my childhood in Velim. When I moved to Cuncolim at the age of 10, this changed. If we wanted fish, we would have to take a stroll to the fish market. Even the stench at the market would automatically fade away at the thought of fish. In Cuncolim, dad had a special fisherwoman he’d walk up to everyday to bag some fish. After he passed away, grandpa and mum continued to purchase fish from the same fisherwoman, Magna. The moment she saw us, she’d start wrapping the fish in paper. She never failed to drop some extra pieces. Once, Magna invited my family over to her place in Ambolim for lunch. It was her parish feast. She promised us a lot of fish to convince us into coming over. We accepted the invite. This was the first time I’d been to a fisherwoman’s house. She cooked the most delicious meal for us on the day. I was surprised to see that my family of five was the only guests. 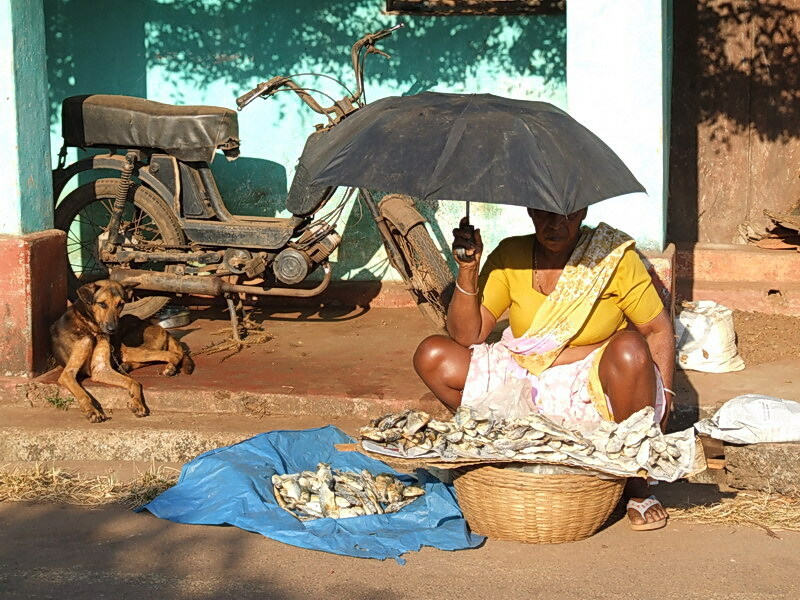 Till date, when I visit Goa, she’ll be the fisherwoman I buy fish from. She never cheats. There’s never a negotiation because the price she quotes is always reasonable. Something about this dinner reminded me about the relationship we embrace with the fisherwomen in Goa. It’s true that we need fish to complete our meal, and that evening, I had a complete meal. Congratulations on the release of your second book – City Adrift. City Adrift has now been in bookstores since the last 10 days. I do have an event Literature Live lined up in November at the National Centre for Performing Arts (NCPA) where I plan to launch the book. What went into choosing City Adrift as the title of your second book? City Adrift is a part of a series launched by Aleph Book Company that covers six cities in India. I, along with five other authors, were commissioned to write about each city. The core hints are the same, and all the books carry the same title description – a short biography of so-and-so city. I must add, telling a story about Bombay is nothing less than a daunting task. There are over 300 books about Bombay, and it’s quite intimidating to be commissioned to write something about the city that’s not been written before. After giving it much thought, I anchored on a theme that revolved around land in Bombay. Why land? I’ve always been fascinated by how the past reflects in the present. For more than three centuries, land (or rather, the lack of it) and soil have remained Bombay’s preoccupations. This is a unique Indian city that has been reclaimed. The Bombay society is assembled. Incentives had to be offered to people from across India to live here to make the city habitable for the East India Company. So I thought it was good to use land as the spine of the book and also to tell the story of Bombay, the drifting city. How long did the research take to put together the 168 pager? Run us through the kind of research that went into materialising City Adrift. I was given a year and a half to complete the project. For a good one year, I was only trying to harbour a particular theme. I started writing in January and was through with close to 40000 words by the end of May, this year. The purpose of this book is to make history visible in the context of present Bombay. A lot of land has been encroached, including the caves. It was a nice form of work. It was a reportage, memoire, personal history and ancient history. It’s always a thrill to tell people stories about the city they live in all their lives. Last year you released a coffee table book called Taj Mahal Foxtrot. Why did you decide to launch a coffee table book? I would just call it an oversized book. During my research on Jazz in Bombay, I gathered a lot of photographs of Jazz bands, musicians etc. So, I wanted to throw all the material to the reader. Pictures tell a story of their own and this was my first and only chance. Along with the book, I also sent along a CD with songs spanning across four decades – from 1927 to 1967. How would you describe Taj Mahal Foxtrot in a nutshell? Bombay: The city I know best is a product of different elements, and music is one important element. I wanted to tell a story of Bombay through a certain kind of music that went back to the time this city tried to get nurtured under colonial rulers. The Portuguese brought along church music and the British, military music. This was the introduction of Western music to Mumbai, to India. The two books you’ve written so far are non-fiction. Would you ever consider writing fiction too? I have no imagination. I lack imagination in the extreme. Since I don’t have stories of my own, I need to tell other people’s stories. I always call myself a journalist. Writers have big ideas, I just consider myself a reporter, a journalist. What about Mumbai fascinates you so much? All the great global forces can be seen in our backyard – industrialisation, liberalisation, religion etc, And I like to see how all of this affect the lives of my neighbours. Not to make it controversial, but so you prefer Bombay over Mumbai or is it because both your books chronicle the city’s past? My friends and I call this city Bombay. If I’m speaking Marathi, I call it Mumbai. Bombay is a colonial name. Mumbai came about after the 1992 riots and when Shiv Sena came to power in Maharashtra in 1995, in partnership with BJP. This is a part of the Sena’s campaign of hate. Though the words Kolkata and Chennai roll easily off my tongue, Mumbai sticks in my craw. I went to St Andrew’s School in Bandra and completed my graduation in Bachelor of Arts from St Xavier’s College, Mumbai. I majored in Economics and Sociology. My imagination led me to believe that Economics had a prospect of giving me a career and Sociology would help me know the world. Fortunately, after my graduation, I signed up for a journalism training programme conducted by The Times of India. This training left an impression on how I think and how I do my craft. I took up journalism because I couldn’t do anything else. This is one profession that legitimately lets you poke your nose into other people’s business. I started with TOI in 1990 because I always wanted to write. Did history ever fascinate you? Well, I’m interested in how history determines our present. It’s the little cause and effect game I like to play. Sometimes the answers are not all clear, but they are broad markers. History tells us what we are the way we are. You are currently the editor of scroll.in. Tell us more about the web-newspaper and your role. My friend Sameer and I have been talking for 10 years about how we can work about the challenges newspapers face. There’s an assumption that politicians are the biggest threat to news publications, but actually it’s the corporates. We wanted to construct a model that’s independent. Scroll.in will focus more in reportage. What’s your role at the New York University’s Institute of Public Knowledge? How did you come about getting this? I am a poesis fellow at the New York University’s Institute of Public Knowledge. I’ve been interested in writing about cities and they had a fellowship programme. It takes me to NY a couple of times for meetings. I get to meet people from different people from different parts of the world and being fed with different views. What are the key challenges you’ve faced as a writer? The challenge about writing non-fiction is to keep the reader gripped. In fiction, a writer can alter the plot to make the story more engrossing. In fiction, a writer needs to construct a narrative from reality. What would you be doing when you’re not reading or writing? I used to play the piano many, many years ago, but now it’s out of tune, so I sleep. My job is to read, write and talk to people. Often, my leisure feeds into my work. Which are the authors you look up to or draw inspiration from? Ramachandra Guha, Amitav Gosh, Kiran Nagarkar, Adam Hochschild, Salman Rushdie and Katharine Boo. Many of these writers have found ways of telling our stories. They’ve influenced me. It’s the writing styles as well as the way ideas are transformed into words. Were you born and raised in Mumbai? I was born and raised in Bandra. For some 60 odd years, my family has been living in Bombay. Prior to that, they were in Karachi pre-undivided India where my father was born. It was my great-grandfather who decided to leave Goa during the colonial rule to settle as Karachi-Goans. Much later, my grandparents decided to settle down in Bombay. How would you describe Naresh Fernandes as a Goan? I like feni and pork sausages. I am Goan in a large cultural way with a large kinship. What’s coming next from your desk? I don’t know. Nothing for now. I don’t have any big ideas. But I’d like it to be something without Bombay in the title. I need to find another theme.